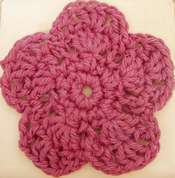 Crochet flower pattern - simple and effective. This free crochet flower pattern came about very recently. My Aunt and Uncle were over here visiting from England. I can't just sit and chat - I have to be doing something. So, this is what I came up with. I hope you enjoy it. You'll need chain stitch and single crochet, slip stitch and double crochet too. For this crochet flower pattern I used a light worsted weight cotton yarn and size 4mm hook. You can just use a hook to suit the yarn you choose. It also depends how 'open' you want the flower to look. I wanted a more 'filled in' look. For a more lacy and delicate - use a finer yarn or thread. It is all worked from the same side - no need to turn it over after each row. I just use the term 'turning chain' as it is widely recognized. Chain 4 and join with slip stitch to form a ring. Chain 1, work 9 single crochets around ring, join with slip stitch to turning chain. Chain 1, double crochet & single crochet in next stitch, *single crochet in next stitch, (single crochet, double crochet, single crochet in next stitch), repeat from * 3 more times ending with single crochet in next stitch. Join with slip stitch to starting chain and slip stitch to top of first double crochet. Chain 2, 2 double crochet in same stitch (top of double crochet of previous round), *chain 2, skip 1 stitch, single crochet into next stitch, chain 2, skip 1 stitch, 5 double crochet into next stitch, repeat from * 3 more times ending with chain 2, skip 1 stitch, single crochet into next stitch, chain 2, skip 1 stitch, work 2 double crochets into same stitch where this round started and join to turning chain with slip stitch. Chain 2, 2 double crochet into same stitch (middle stitch of 5 double crochets), *chain 1, skip 1 stitch, 1 double crochet into next stitch, chain 2, skip 1 stitch, single crochet into next stitch (single crochet of previous round), chain 2, skip 1 stitch, double crochet into next stitch, chain 1, skip 1 stitch, 3 double crochet into next stitch, repeat from * 3 more times ending with chain 1, skip 1 stitch, double crochet into next stitch, chain 1, skip 1 stitch, single crochet into next stitch, chain 1, skip 1 stitch, double crochet into next stitch, chain1, join to turning chain with slip stitch. Finish off. Ch 4, join with sl st to form ring. Ch 1, 9 sc around ring, join with sl st.
Ch 1, (dc, sc) in next st, *sc in next st, (sc, dc, sc in next st), rep from * 3 more times ending with sc in next st. Join with sl st to starting ch and sl st to top of 1st dc. Ch 2, 2 dc in same st (top of dc ofprev rnd), *ch 2, sk 1 st, sc in next st,ch 2, sk 1 st, 5 dc in next st, rep from *3 more times ending with ch 2, sk 1 st, sc in next st, ch 2, sk 1 st, 2 dc in same stwhere row started, join to turning ch with sl st.
Ch 2, 2 dc in same st (middle st of 5 dc), *ch 1, sk 1 st, 1 dc in next st, ch 2, sk 1 st, sc in next st (sc of prev rnd), ch 2, sk 1 st, dc in next st, ch 1, sk 1 st, 3 dc in next st, repfrom * 3 more times ending with ch 1, sk 1 st, dc in next st, ch 1, sk 1 st, sc in next st, ch 1, sk 1 st, dc in next st, ch 1, join to turning ch with sl st.Finish off. Use this crochet flower pattern as a coaster, in doilies, as patcheson jeans or a sweater, or work a bunch and make a poncho - that's what I'm doing right now. You'll see the result here soon. Here's a great idea...add your flowers to a personalized card! Christina from Card-Making-Magic.com has made a beautiful Birthday card incorporating these simple flowers. Check out her site for more fabulous card-making ideas. Work it in wool, felt it and use it to fancy up a plain purse. Work one completeand one to the end of the 4th row and layer them with a button stitchedin the middle for a different look.You could even work it in a bulky craft cotton as a dishcloth. Get your imagination going and let's see what uses you can come up with for this cute little crochet flower pattern. Add your flower to this free crochet hat pattern. Embellish this free crochet scarf pattern with flowers too. Try working your flower in wool then felting it! Return to Homepage from crochet flower pattern.